Marrrrcooo~ RUBIO!!! Orange Crush is finished. October 16, 2010. Tags: 2010 elections, Charlie Crist, conservaive politics, Fiscal Conservatives, FL politics, FL Senate debate, FL Senate Race, Florida Senate Race, Marco Rubio, Marco Rubio on family, Meek, midterm elections, Rubio Crist, Tea Party Patriots. Politics. Comments off. August 24, 2010. Tags: 2010 GOP Primaries, Bill McCollum, FL politics, FL Primary, J.D. Hayworth, Jeff Greene, Joe Miller, Kendrick Meeks, Lisa Murkowski, Marco Rubio, Rick Rolled, Rick Scott, Tea Party Patriots. Economy, Obama Administration, Politics, Popular Culture, Taxes. 1 comment. Update 2: The Hill has a breakdown of the charges which include grand theft, fraud and money laundering. …The Florida Department of Law Enforcement has scheduled an 11:30 press conference. Greer resigned from the party in January, under fire for lavish spending and for an undisclosed fundraising contract that paid him and his executive director, Delmar Johnson, $199,000 in 2009. According to the RPOF, $125,000 of that went to Greer. New party chair John Thrasher had requested an investigation of the deal, and Attorney General Bill McCollum turned the case over to FDLE…. oh boy. This is the joker who Crist put in there who resigned after trying to ‘help’ Charlie by releasing Marco’s credit card records…FOX broke it but no word on the charges yet…is it possible this is why Holder shunned the FL A.G. yesterday? (he met with MISS LA AL AGs but not FL) I dunno. June 2, 2010. Tags: Charlie Crist, FL politics, FL Senate Race, GOP Chair FL arrested, Inner Circle, Jim Greer, Marco Rubio. Politics. Comments off. Update: Message from Team Rubio: May 12th is Shameless Politicians Day! May 12, 2010. Tags: 2010 elections, Charlie Crist, Conservative Politics, Economy, FL politics, Florida Senate Race, GOP Politics, Marco Rubio, moderate Democrats, Tea Party Patriots. Economy, Politics. 1 comment. Sorry Charlie! Crist tries to call Rahm, gets the brush-off, decides to lose to Rubio as an Indy…. I have long thought Charlie Crist and Jennifer Granholm are on the’ favor’ list for Team O as they helped block revotes in FL and MI in the Democratic primary. Charlie Crist, soon to be independent Senate candidate from Florida, tried to reach White House chief of staff Emanuel through intermediates. WH refuses to take the call. Dems plan big talent/money blitz for Kendrick Meek. What’s Crist up to? Might he be interested in cutting a deal to caucus with the Democrats if they chase Meek from the field? Who knows? But the most plausible path to victory for Crist is if Meek backs him. That’s a real possibility, I think, later in the game if Rubio and Crist are each getting about 40% in the polls and Meek is getting about 20%. But, as voters get to know the lesser-known Rubio and Meek, it’s probably more likely they emerge as the frontrunners and Crist fades as election day approaches…. Of course O and Rahm aren’t taking Charlie’s calls and even if they were, O has lost his cache, especially in Florida where they hate the health care bill more than most of America. Marco is going to kick Charlie’s axx come November….it will be sweet schadenfreude for this Hill supporter and Rubio fan! April 29, 2010. Tags: Charlie Crist, crist calls WH Rahm, Economy, Energy Policy, FL Senate Race, jennifer granholm, Marco Rubio, Stimulus. Politics. Comments off. Does Crist still have a place in the GOP? Romney says he does. “He has a place in the party, because he’s still in the primary,” he says. “I hope that he either continues in the primary, or, if he concludes that he does not want to remain in the primary, steps aside and helps to unite the party behind Marco Rubio.” And if Crist plays his cards right, Romney believes he will have a future in Republican politics. “Down the road, or in other spots, he may well find a place where he can make a real contribution. He helped to build the Republican party in Florida, and he certainly wouldn’t want to be one of those who want to detract from it.”.. Emphasis mine, I think that is Romney offering a nice spot to Charlie in ’12 or on his ’12 campaign staff if he will drop his Indy run…code for, hey if I get the primary spot in ’12 you won’t be on my coattails if you screw the party..but Crist is one of those with no loyalty whatsoever or he wouldn’t have pulled a ‘Bill Judas Richardson aka Arlen Benedict Specter’ on Rudy when he flipped his backing to MAC with no notice now would he? Hotline reports that Sen. John Cornyn (R., Texas) called Gov. Charlie Crist to urge him not to run as an independent in the Florida Republican Senate primary. Crist did not answer the phone, and has reportedly not returned the call. Gov. Charlie Crist is making two appearances in the Tampa Bay area Monday, including a stop at his high school alma mater. Crist, praised by teachers for vetoing a controversial bill last week that sought to tie teacher pay to student performance, stops at St. Petersburg High at 12:30 p.m. The governor will address the school in the auditorium and may take questions from the audience, which will include students. …Rubio has spent much of his campaign focused on health care. Is he a fan of Romney’s Massachusetts health-care plan? “It’s a work in progress,” Rubio says, speaking of the Bay State program. Free and Strong America, Romney’s PAC, is contributing the maximum $5,000 allowed to Rubio’s campaign. In 2006, Romney, then head of the Republican Governors Association, traveled to Florida to support Crist’s gubernatorial candidacy with a $1 million check. In light of that history, Rubio says, Romney’s endorsement is “another boost” for his campaign…. Since people are all ‘wee weed up’ about how to handle MASS UHC in ’12 if Romney wins the primary, can I add I would like to vote for the Romney/Rubio ticket? Of course I am a recovering Dem without a voice in the GOP primary, but hey I am all on board with Mitt-Marco. The business saavy of Mitt, with his slightly squishy center on some social issues to keep we moderates, plus the rock solid fiscal conservatism of Marco and all he brings on social issues to the ticket for those on the right. Win/Win AFAIAC, easy on the eyes too *cough cough* fundraising calendar GOP where is it? ! April 19, 2010. Tags: 2010 elections, 2012 elections, Charlie Crist, Conservative Politics, Economy, FL Senate Race, GOP Politics, Health Care, Marco Rubio, Mitt Romney, Mitt Romney endorses Marco Rubio, Obama Health care plan, Romney health care plan, Romney Rubio 12, Romney/Rubio 2012. Economy, Obama Administration, Politics, Popular Culture, Taxes. Comments off. 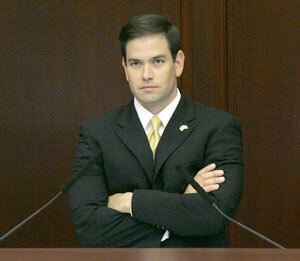 On Tuesday, April 13, Marco Rubio appeared on Sean Hannity’s Fox News show at a campaign stop in The Villages. The stop was part of Marco’s “Take A Stand” tour, as he travels the state talking to Floridians about how we must send someone to Washington who will fight the Obama-Reid-Pelosi agenda and offer conservative alternatives. Chris Wallace claimed Marco didn’t have support in The Villages during that Crist- Rubio televised debate. CLEARLY Wallace does not know what the heck he is talking about. Marco has support in The Villages, all across FL and nationally, heck I am supporting him from AZ!! April 14, 2010. Tags: 2010 elections, Charlie Crist, Conservative Politics, Florida Politics, Florida Senate Race, GOP Politics, Marco Rubio, Rubio at The Villages, Sean Hannity interviews Marco Rubio at the Villages. Economy, Finance, Obama Administration, Politics, Popular Culture, TARP, Taxes, Unemployment Statistics. Comments off.